French President Emmanuel Macron (right) and Chinese President Xi Jinping applaud as the president of Airbus’s commercial aircraft business and the chairman of China Aviation Supplies Co. shake hands during an agreement signing ceremony at the Elysée Palace in Paris, on March 25. Chinese President Xi Jinping visited Europe from March 21 to 26, meeting with European leaders from Italy, France and Monaco, and signing an important series of deals related to China’s Belt and Road economic initiative. On March 23, Italy became the first G-7 nation to sign on to the initiative. Xi and Foreign Minister Wang Yi with Italian Prime Minister Giuseppe Conte and Labour and Industry Minister Luigi Di Maio signed 29 deals on everything from banking to energy to sports, worth $2.8 billion. The China Communications Construction Co. will begin port management activities at Trieste and Genoa. Trieste is especially valuable to China’s Belt and Road Initiative, since it provides access to the landlocked nations of Central and Eastern Europe. 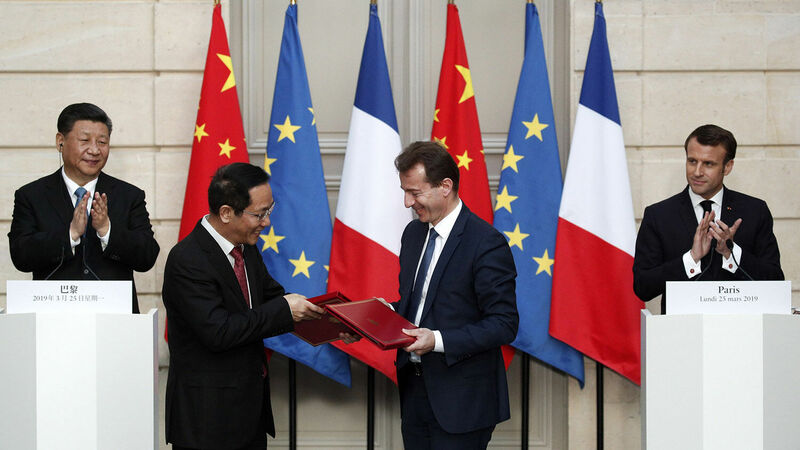 On March 24, Xi arrived in France, where he signed trade deals worth $11.2 billion, in addition to a large $35 billion order for Airbus. The deal signals cautious but increasing economic cooperation between China and European nations. In total, the Chinese will receive 300 new airliners from the European aircraft manufacturer, a sizable order. The deal with Airbus is a disappointment for Boeing, following the grounding of its most popular medium-range plane, the 737 Max, across the globe following two fatal crashes over a five-month period, apparently related to flight control software. Those involved in the deal were likely aware that the order is for the exact same number of planes China ordered from Boeing in 2017. In France, Xi also met with German Chancellor Angela Merkel. Together with French President Emmanuel Macron, they discussed “renovating multilateralism,” a veiled reference to shifting more world trade away from the United States. Xi, Macron and Merkel discussed their shared commitment to multilateral trade relations. Despite this recent avalanche of deals, the European Union remains wary of China on several fronts. “Obviously the exercise of power in human history doesn’t happen without rivalry,” Macron said. His comments show what most EU nations believe: The deals with China can move forward, but with caution. For the first time ever, the EU officially labeled China as an “economic competitor” and “a systemic rival promoting alternative models of governance,” in a paper published March 12. Then there is the debate over Chinese telecom company Huawei, and whether or not its infrastructure should be used in the 5G telecommunications networks that the EU is planning to construct. The EU looks unlikely to ban Huawei, but remains skeptical. At this point in time, most analysts will say that the EU-China situation could go either way. China could draw nearer to the EU and make more deals, even to the point that America becomes alienated from the rest of world trade. Others will say that the EU-China trade will be short-lived. Yet there is an often-overlooked source that predicted the Belt and Road Initiative, the cooperation we see today, and the friction that comes with it; and it did so thousands of years in advance. The Bible predicts a trade relationship between European and Asian nations. In Isaiah 23, God describes a trade alliance between Chittim (an ancient name for China) and Tyrus (elsewhere called the king of the north, referring to Europe). He calls this commercial alliance a “mart of nations.” (Read our article “The Great ‘Mart of Nations’” to learn more, and order your free copy of Isaiah’s End-Time Vision.) The relationship between China and the EU will be powerful, but also fraught with mistrust. The Bible says these two powers will ultimately drift apart again and confront each other militarily. This will be the result of China-EU cooperation. Europe’s increasing participation in the Belt and Road Initiative will have grave consequences for America, and will dynamically change the world you live in. To read more about how this growing trade relationship will hurt America, request your free copies of Ezekiel: The End-Time Prophet and Isaiah’s End-Time Vision.